Basically, you can’t avoid them! Last year, Dufry launched its own app-based loyalty programme called RED By Dufry. The key benefit of downloading this app is that you get a 5% or fixed cash discount on purchases at selected Dufry stores. Back in 2017, the app – and therefore the discount – only worked in a handful of countries, excluding the UK. It has now been rolled out and the UK IS now included. Not all airports offer a flat 5% discount. Annoyingly you need to look at the RED website to see what is available for any particular airport. At Heathrow and most other UK airports, for example, you will get a £5 discount at World Duty Free for spending between £75 and £99. If you buy at World Duty Free or Dufry on a regular basis, you could make decent savings by downloading RED By Dufry for iOS or Android. With $400 of spend you reach Gold level, where your discount rises to 7%. At $1000 of spend, over a two year period, you reach Platinum. As well as increasing your discount to 10%, you receive various other benefits. Certain airports have their own additional deals. Spend €150 at Barcelona-El Prat, Adolfo Suarez Madrid-Barajas, Bilbao, Valencia or Seville airports and you will receive free lounge access, for example. At Heathrow, I imagine that you will continue to receive Heathrow Rewards points on top of your RED discount. Download the RED by Dufry app to your smartphone. That’s it! The app displays a QR code which can be scanned in-store to ensure you get your discount and your points. You can add your Iberia Plus or Vueling Club Avios number during the sign up process or later. It is under the ‘More’ tab on the sign-up page. And there is an Avios angle too …. Iberia Plus and Vueling Club are partners with RED By Dufry. You can either flash your Iberia Plus or Vueling Club card or the RED By Dufry app. As long as the two are linked, you will get your Avios. 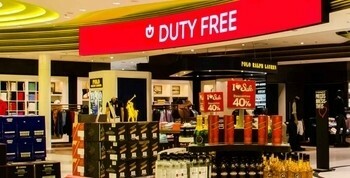 Spend €40 at Dufry in Madrid Airport and you will receive a 5% discount, saving €2, and receive 114 Avios points (3 per €1). Hopefully the Avios angle will expand to the UK at some point soon. You can find out more about the Avios angle of RED By Dufry on this page of the Iberia website. The full list of airports covered by RED is here. I’ve used it successfully in Barcelona but only had a 50% hit rate in Zurich. They don’t seem to have told the people working on the tills what it is, and some super stiff Swiss refuse to scan the barcode!!! There might actually be some decent booze offers in DF after March 2019! You know how the best offers @ UK airport DF are only for non-EU/EEA flights? Those could be made open to Brits, I guess, depending on how the negotiations go. Might save me £10 a year, which goes some way to make up for the £900 each UK household is worse off after the vote. That’s £900 so far, and we haven’t even exited yet. Good luck making up that gap. Have to drink most of your bargain booze while you’re away, since you won’t be allowed to bring very much back in to the UK? I have NEVER been asked how much Duty Free (as opposed to duty paid within the EU) booze I have brought back to the UK – I think Customs have more important things to worry about. A 3l bottle of Frosty Jack’s cider containing 22.5 units, which costs around £3.59 in rUK, costs around £11.50 in Scotland A 150cl bottle of Lambrini containing 11.3 units, which currently costs around £3 in rUK, costs at least £5.65 in Scotland. So if you and Mrs RH lived in Dumfriesshire and glugged down a bottle of Scrumpy Jack’s and a bottle of Lambrini between you every night, you’d be £3,850 a year better off just by getting a friend with a van to drive you to Carlisle and stock up. Ah yes, the “booze cruise” to England – who thought that would ever be a thing?! I’d just add that the 5% discount doesn’t apply to tobacco and alcohol/wine. At least in Greek airports it didn’t. Does anyone know if you can you collect Heathrow Rewards with this offer? I assume you can. Heathrow would be unhappy if you couldn’t. Yes you can! Just close your eyes and run through them! Usually overpriced stores flogging tat that is out of fashion to bored travelers using up currency before going home. They should turn the space into more seating as there is never enough at airports. Hence why I buy a lounge pass! I downloaded the app and registered last week at Pulkovo airport (LED) in St Petersburg – you can instantly get 5% off. Just handy for those who are buying World Cup merchandise, for example. – Silver members get “£5 off spend between £75 and £99” – therefore nothing if you spend over £99? – Gold members get “£7.50 off spend between £100 and £149” – so nothing on spend under £100? – Platinum members get “£12.50 off when spending £150 or more” – so nothing less than that? It seems that Gold or Platinum members are worse off than Silver for smaller transactions. Or if you would be a big-spending silver, you’re better off buying something cheaper to start with, and saving your next shop for another flight. I agree, couldn’t understand this myself UNLESS you also get access to the offers on the lower tiers and this is just an incremental status benefit. Signed up to the app last week and shows Gold member. Spent 2 x Euro 200 at BCN yesterday, no mention of the lounge pass, no discount as spend was on cigs, just hope the 6x avios for the 400 euro spend credits to my IB account.